IF YOU PLAN TO VISIT OR ATTEND AN UPCOMING EVENT AT 48 FIELDS, THE DETAILS BELOW PROVIDE INFORMATION AND ANSWERS TO QUESTIONS YOU MAY HAVE. The venue is a private estate run by its owners. Tours for wedding couples or new vendors who wish to visit the property are made by appointment only. 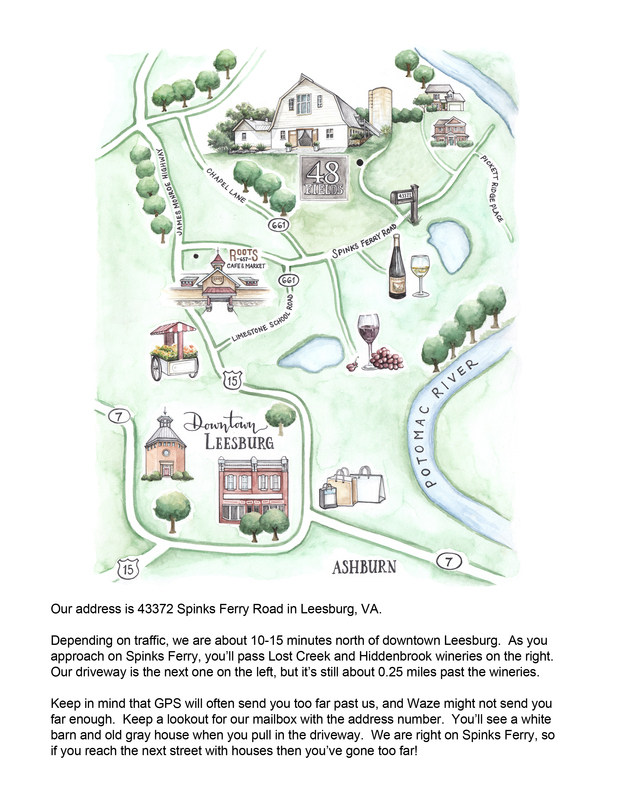 Our address is 43372 Spinks Ferry Road in Leesburg. Keep in mind that GPS may send you too far and Waze may not send you far enough, so be on the lookout for our mailbox with the address number on it. Our driveway is on the left, about 0.25 miles past the entrances for Lost Creek and Hiddenbrook wineries. You will see a white barn and old gray house when you pull in the driveway. Download a printable map and directions. Cars will travel down a gravel road and driveway to reach 48 Fields. Parking is designated to a well-drained grassy area just beyond our two wooden barns in an open field. Typically a 48 Fields staff member will assist with parking during events to ensure that each car has ample space and is not blocking another guest. It is a short walk to our event spaces, but guests requiring more immediate parking can be accommodated closer in. Vendors are permitted to unload their equipment by entry doors but are then instructed to move their cars to the parking area. Space is available for larger vendor trucks and trailers as well as waiting space for guest shuttle buses. A variety of hotels are located in Leesburg, Lansdowne, or Ashburn. It is a 10 minute drive to downtown Leesburg, 15 minutes to Lansdowne, and 20+ minutes to Ashburn. Luxury restroom trailers are provided for guests’ use. These multi-stall facilities are climate-controlled and outfitted with granite countertops and wood trimmed details, suitable to the formalities of a wedding. Smoking is allowed only in a single designated area located near the receptacle provided on the graveled area behind the Dairy Barn. No smoking is permitted inside the barn or on the deck. This includes cigars and e-cigarettes. Keep in mind that Route 15 is the only main road to reach our venue. As a two-lane road however, traffic can slow the pace of travel between downtown Leesburg and White’s Ferry Road on weekdays between 3:00pm – 6:30pm. This is important to know if you are attending a wedding rehearsal on a Friday afternoon. In this case, you may want to add an additional 15-30 minutes to your drive time.